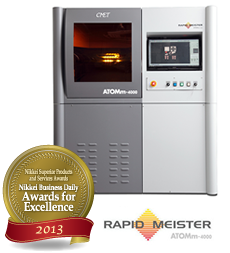 The successor model to the RM-3000, the middle size stereolithography machine, ATOMm-4000 has a bigger worksize and more affordable price than RM-3000. Working together with the manufacturing field in Japan for over 20 years, now we want you to find more access to the stereolithography technology that has reached the state of maturity. This is the machine to realize our wish. Saving about 50% of initial cost for introducing stereolithography machines. Loaded with our original scan system TSS4, which is same as EQ-1. Designing speed and path accuracy greatly improved compared to the predecessor TSS2.